Traces of iron age „Celtic fields“ probably older than 2000 years are preserved in historically ancient forests in Schleswig-Holstein. Only one example of it is (insufficiently) dated. Numerous chaircoal samples which have or should been taken from the walls between the parcels shall be dated by radiocarbon method. So the estimation of the age of those Celtic Fields should be posed on a more fundamental basis. The ancient fields which were installed obviously two millenniums ago after clearance of the then overall forests, seem to represent the first kind of agriculture which remained stationary over a long time. So it could leave traces in the landform relief. Those traces are known since longer time especially from England, north-western Danmark and the Netherlands and are called (not quite correctly) „Celtic fields“. 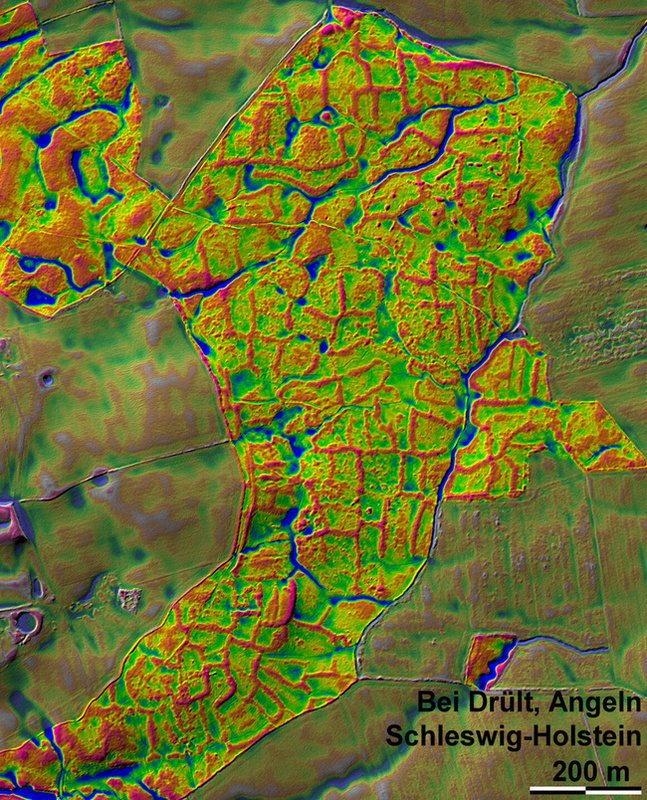 Since 2011 I discovered much more than 100 field systems containing several thousand parcels in the relief pictures which can be generated by the laserscan elevation dates of Schleswig-Holstein. Up to then only a part of it was known, mostly fragmentarily. Nearly all field systems were preserved in historcally ancient forests, where the surface did not change since the iron age for more than 2000 years. The traces of the field systems are normally bathtub-formed parcels, which are limited by broad and very flat walls. The parcels form an irregular systems of rectangles, were parcel lies next to parcel – without tracks between. The sizes of the parcels are very different, but include commonly areas of 1000 – 2000 qm. Only one single field system was investigated intensively, but 25 years ago. The estimated age of those field systems is based of the forms of few ceramic sherds found there. It was and is still a relatively simple task to collect chaircoal samples from the walls in order to gain radiocarbon dates of the phase of use. At least 20 of them should be dated. Why so many? A single sample may result from a much later ord much older activity (stone age) by chance. However, the weitaus major part of it should date the phase of origin and use, which is estimated shortly before birth of Christ up to now according to few ceramic sherds of a single field system. But it could also be half a millenium older. If the latter is correct, the innovative agricultural systems which result in the preserved fields could be a human reaction to a striking climatic change which is proved for that time: it became wetter and cooler. 6300 € are needed for the dating of 20 samples, 315 € each.